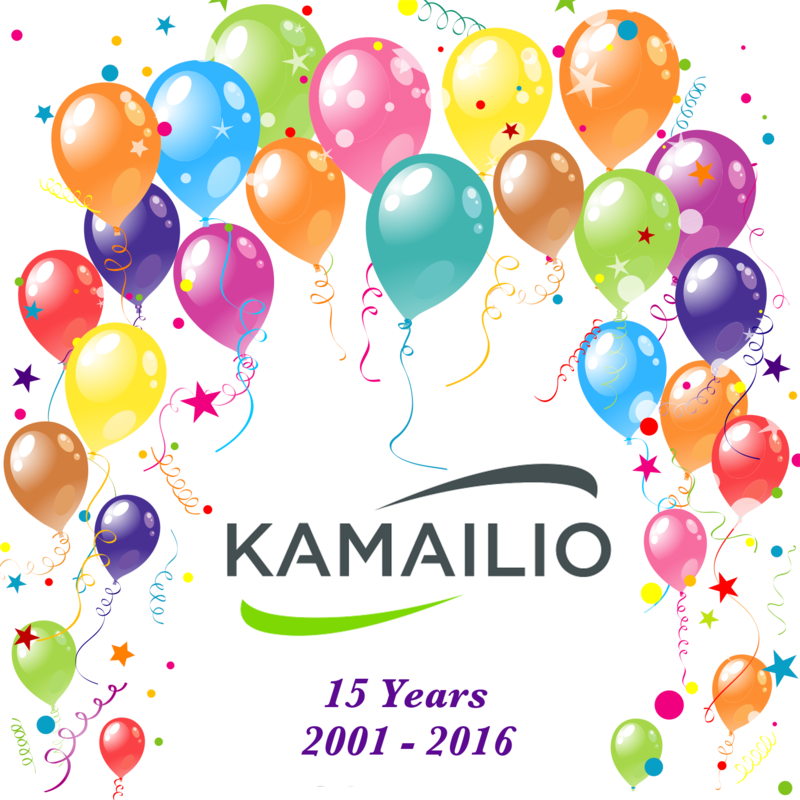 Passing the 15 years of development marker for Kamailio project few months ago, we are now approaching the end of 2016. A long list of people devoted a lot of time in sustaining the project with resources for development, support and advertising. So this is a good moment to thank and greet them, everyone involved in Kamailio project, old and new friends, developers, contributors, the engaged and warm community members. We are very close to the moment of freezing the version 5.0.0, a new major milestone in the project evolution, with a restructured source code tree, cleaner and slimmer code base, a new flexible configuration file framework that allows building SIP routing script in embedded languages such as Lua and Python, a.s.o. – all making a very solid foundation for developing next releases! Good premises to expect a lot of new stuff in 2017! The 5th edition of Kamailio World Conference, the project’s annual event, is scheduled for May 8-10, 2017, in Berlin, Germany. We look forward to meeting many of the community members there! Management Interface (MI), the old line-based text protocol interface to interact with Kamailio is going to be removed in the near future. It was declared obsolete several years ago, when we introduced the RPC interface. With upcoming version 5.0 already having the code source tree restructured, this step makes a better and slimmer foundation for next generation of releases. The default configuration file is now shipping with jsonrpcs module and kamctl tool is using the RPC interface via jsonrpcs. The command line parameters for kamctl should be the same like for the past releases, but the output is now in jsonrpc format. ctl – binary rpc protocol – with transport layers for FIFO file, unix sockets and IP sockets (both datagram and stream). It is the module used by the kamcmd tool. jsonrpcs – jsonrpc protocol – with transport layers for FIFO file, unix and IP sockets (datagram) and HTTP via xhttp module. It is the module used by kamctl and kamcli tools. If you were using mi_fifo or mi_datagram modules, then you can switch to jsonrpcs module (it offers the transports for the two mi modules). If you were using mi_xmlrpc, then you can switch to xmlrpc module. The Makefiles for building the application are in src/, with a new root folder Makefile that does target forwarding to src/. You should be able to use the same make commands inside root folder as well as inside src/. The kamailio binary is built in src/ directory. While some small adjustments may still be done, we hope that the new structure is going to make the long term management and development of the project smoother. As a side note, the organizing of the 5th edition of Kamailio World Conference has started, being planned for May 8-10, 2017, in Berlin, Germany. More details will be available in the near future! Kamailio SIP Server v4.4.4 stable is out – a minor release including fixes in code and documentation since v4.4.3. The configuration file and database schema compatibility is preserved. Kamailio v4.4.4 is based on the latest version of GIT branch 4.4, therefore those running previous 4.4.x versions are advised to upgrade. There is no change that has to be done to configuration file or database structure comparing with older v4.4.x. A new Kamailio IRC devel meeting to has beep proposed to discuss the current major issues and the plans for next Kamailio releaseThe target time frame is Nov 08-10, 2016 (Tuesday, Wednesday or Thursday). If many developers are not available, it can postponed it to another date in the near future (make proposals if that is the case for you). Add there the topics that you want to be discussed and your availability. Coordinated by its founder Alan Quayle, with the help of many local teams across the world, TADHack Global 2016 edition was organized during October 14-16 in over 30 cities, counting over 2600 registrations that resulted in over 170 hacks. It is probably one of the largest hackathons recorded so far, maybe even the largest, anyhow, for sure in the telecom world. A snap is a fancy zip file containing an application together with its dependencies, and a description of how it should safely be run on your system, especially the different ways it should talk to other software. Most importantly snaps are designed to be secure, sandboxed, containerised applications isolated from the underlying system and from other applications. Snaps allow the safe installation of apps from any vendor on mission critical devices and desktops. Aiming to ease the deployment of applications across different Linux-based systems, wrapped with proper layers of security, the snaps concept look very promising. “”I am glad that I could participate to the TADHack Global 2016, the local event in Berlin made it easier in a rather busy period of traveling, huge credits to Alan and Dennis for making it possible. As for the hack, what Canonical/Ubuntu was offering during the hackfest was a perfect fit for me – a Linux/Ubuntu cloud infrastructure to meet the needs of scaling deployments and RTC platforms. As one of core developers of Kamailio SIP server project, I wanted to do something using it, that, after all, can also be useful for our community. Cloud, virtualization, containers — all very hot concepts these days. But snaps target to be even slimmer, still avoiding annoying issues such as broken dependencies and different versions of libraries on different distributions. I heard about them, but never got the time to play with. TADHack global offered the chance that I didn’t want to miss. The hack-intense environment and discussions with other people around helped to clarify some doubts (hey Torsten, Dominik, Dennis). Once I started to build snaps and test them running, I realized that the sandboxed snap restricts some privileges that Kamailio uses when running on Linux, such as creating raw UDP sockets. With a bunch of patches after many try-and-errors, I was able to get the stock Kamailio from our github.com repositorybuilt and run as a snap. It felt that the participation to the TADHack was fruitful already. The prize announced few days later came as a very pleasant complement awarded by Canonical/Ubuntu. Next are the relevant resources for Snappy Kamailio. If you are interested in Kamailio snaps, join our development community on sr-dev mailing list. is a successor to the previous XMPP and telephony dev-rooms. participants for the tables in the Real-Time lounge. be present for both days. Real-Time Communications dev-room: deadline 23:59 UTC on 17 November. be kind enough to tell us if you do this by filling out the notes in the form. personally if you would like to ask any questions about it. remember to re-use your account from previous years if you have one. URL of a feed with posts tagged for your RTC-related work. years so that more speakers can participate. Please note FOSDEM aims to record and live-stream all talks. The CC-BY license is used. potentially in collaboration with the XMPP summit. be interested in participating, sponsoring or hosting such an event. about it, especially if you are submitting a talk. this helps everybody in the free real-time communications community. This year, the focus is on understanding application drivers and technology evolution towards softwarized 5G networks and the industrial internet revolution. This year the FUSECO Forum will be accompanied by 2 additional international events on 5G, all of them held during the same week in Berlin. Don´t miss any of them and get ready for 5G and the Industrial Internet of Things! 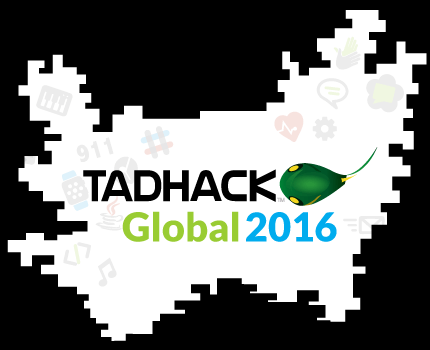 TADHack is the global meeting place for developers who want to learn, share, code and create using the tools and technologies available in telecommunications. The Berlin event is hosted by VoIP Lab, part of Buro 2.0 co-working space, being coordinated by Dennis P. Kersten during October 15-16, 2016. Several Kamailio developers from Berlin area are participating to the event. Any developer can participate for free, you are welcome to join us in Berlin or anywhere around the world — you can do it also remotely, from your living room or your preferred working space. Think about an idea to code, hack and demo it for wining some nice goodies from sponsors! The Asterisk Users Conference – AstriCon – is taking place in Glendale, Arizona, during September 27-29, 2016. With a consistent group of VoIP community using both Kamailio and Asterisk projects, Kamailio will have again a strong presence on site this year, including the participation in the expo floor, coordinated this edition by Fred Posner. Along with him, you may meet around Torrey Searle, Nir Simionovich, Joran Vinzens and others that can answer your questions about Kamailio and Asterisk. Like in the past editions, several presentations will touch the use of Kamailio and integration with Asterisk — see agenda. It is definitely a must-attend event if you are looking to build flexible real time communications using Kamailio and Asterisk, or even beyond that, there are not many places around the world where you can find so much VoIP knowledge at the same time along the year! Next European edition of Kamailio Advanced Training will take place in Berlin, Germany, during October 24-26, 2016. Looking forward to meeting some of you in Berlin! Kamailio SIP Server v4.4.3 stable is out – a minor release including fixes in code and documentation since v4.4.2. The configuration file and database schema compatibility is preserved. Kamailio v4.4.3 is based on the latest version of GIT branch 4.4, therefore those running previous 4.4.x versions are advised to upgrade. There is no change that has to be done to configuration file or database structure comparing with older v4.4.x. The project was initially named SIP Express Router (aka SER), years later – after a fork, a rename and a merge – it converged into into what is now the Kamailio project. It has been a fabulous journey so far, in a more than ever challenging market of real time communications. Well known for its performances, flexibility and stability, Kamailio has set a relevant footprint in open source and open communications, enabling entities world wide to prototype, launch new services and build scalable businesses, research and innovate in real time communications. More over, the project has succeeded to create an amazing community of users and contributors, the real engine behind its successful evolution. Its time to celebrate the moment, everyone involved deserving it — thank you all! In a few months the project will deliver v5.0.0, its 16th public major release, with a restructuring of the source tree to match current modern approaches and more flexibility in choosing the language for building the desired SIP routing rules. Stay tuned! The 96th meeting of IETF (the Internet Engineering Task Force) takes place in Berlin, Germany, during July 17-22, 2016. Ahackaton tied to the IETF meeting is organized during the weekend, July 16-17 . Among the major standardization topics to be discussed, from Kamailio point of view, are: SIP, WebRTC, TURN, IPv6, TLS and DNS (DNSEC/DANE). Daniel-Constantin Mierla and Olle E. Johansson from the Kamailio community will be present at the event. Together with Lorenzo Miniero from Janus WebRTC Gateway project, they plan to organize a meetup (for drinks/dinner) on Monday evening, July 18 — likely to happen at a restaurant nearby IETF meeting, starting around 20:00. If you are in Berlin and want to join, contact us (email to sr-users mailing list or contact directly one of these three persons). Each participant will take care of own expenses, we aim to have an open discussion about what’s new lately and where we head on in real time communications space. Looking forward to meeting some of you next week in Berlin! Kamailio SIP Server v4.2.8 stable is out! This is a minor release including fixes in code and documentation since v4.2.7. Kamailio v4.2.8 is based on the latest version of GIT branch 4.2. If you are running previous 4.2.x versions are advised to upgrade to 4.2.8 (or to 4.3.x/4.4.x series). If you upgrade from older 4.2.x to 4.2.8, there is no change that has to be done to configuration file or database structure comparing with older v4.2.x. Important: this version marks the end of planned releases from branch 4.2. From now on the focus is on maintaining the branches 4.4 and 4.3 for stable releases. Thank you for flying Kamailio! Enjoy the summer holidays!